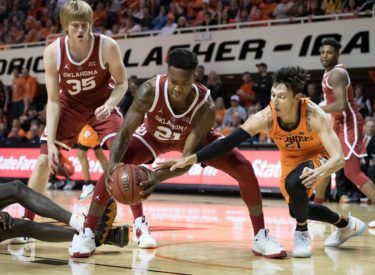 STILLWATER, Okla. (AP) – Freshman guard Jamal Bieniemy scored a season-high 17 points, and Oklahoma rallied from a 19-point deficit to defeat Oklahoma State 70-61. Brady Manek scored 15 points and Jamuni McNeace added 13 points for the Sooners, who shot 64 percent from the field in the second half. The Sooners had lost two straight to drop out of the Top 25, but they bounced back to sweep the season series with the Cowboys.